I remember her every word and every intonation. I will not repeat what she said, though it will always echo in my daydreams. The broad sense of it was that she was offering me everything…All would fear us and love us and no one could ever touch us. I’ve had a bad week. Perhaps even a wretched one. While I try to be a person who believes that the glass is half full, rather than empty, I can’t help but feel that the meeting I had this past week with my dissertation adviser has led to many questions–about my project, about the future and about what role I see myself playing in this field. I certainly don’t believe that any one person has to follow any particular life path (that would be too simplistic and not allow for the unexpected things that inevitably pop up), but it’s always hard to think of yourself as potentially going off into the Great Unknown and forging a new road. Mind you, as of this moment and year, these are just thoughts. And not even thoughts that arose in the aftermath of an unpleasant meeting; when your career choice involves the (supposedly dying) humanities, it’s always a good idea to be realistic, to think about the roads that haven’t been traveled and that you might want to go down in the distant future. 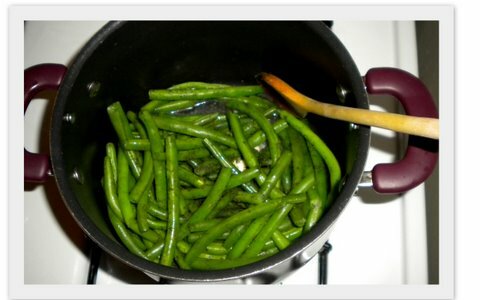 But what does this have to do with green beans? Both everything and nothing. You see, this past Tuesday–the day before the meeting–I went home exhausted after a very full day, but was nonetheless determined to make a recipe from The Essential New York Times Cookbook. Although the book is, in general, a treasure trove of fascinating recipes, I decided to start with Heirloom Pea Pancakes (or a slightly modified version of them). And mainly because both peas and pancakes are two of my favorite things. To make things easier for myself (or so I thought) I had bought sugar snap peas in advance; all I needed to do on Tuesday evening was shell them, puree them and turn them into pancake batter. It all seemed reasonable until I opened the bag of what I thought were sugar snap peas and discovered that I had mistakenly bought green beans instead (how one confuses green peas and sugar snap peas, I don’t know. I assume my head was in the clouds, or was already moving onto the search for the perfect cherry tomatoes…). Although I would never say that I dislike green beans (I actually like them a lot), my disappointment was acute. I was not in the mood for green beans, nor did I know what to do with them. Should I turn them into my old faithful green bean salad, or should I find something new to make in the Essential Book? Feeling adventurous, I went with the latter option. 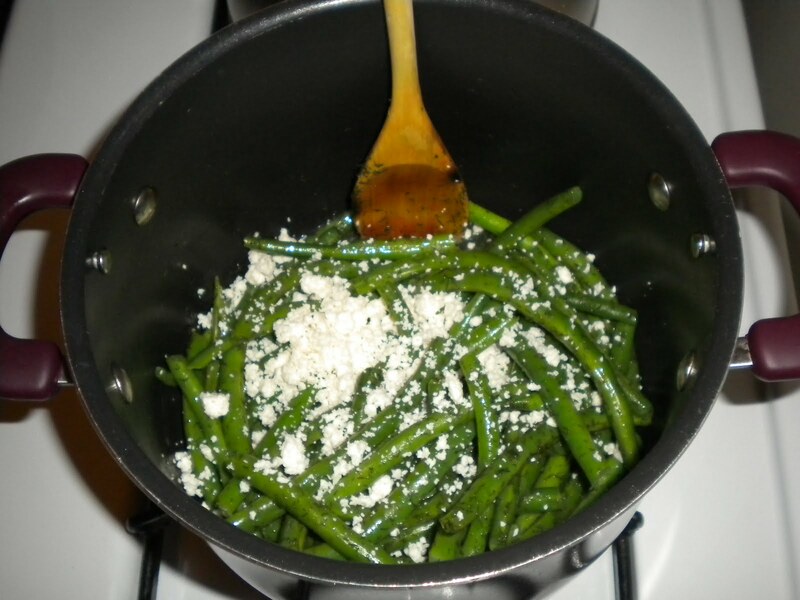 I was most intrigued by the sound of Green Beans with Coriander-Coconut Crust (now on my must make list), but, to my great misfortune, I didn’t have fresh coconut laying around my apartment. Clearly, it was “Wrong Ingredients 2, Poor Hungry Girl 0.” But then I saw something that looked almost too easy and that couldn’t fail: Rachel’s Green Beans with Dill; in short, a combination of butter, blanched green beans, sea salt, pepper and dill. I could make that; I had everything on hand. The Poor Hungry Girl had finally won a point(! ); she even got another after having decided to personalize the recipe by adding half a cup of crumbled feta and lemon juice to the mix (if you can’t have pancakes, you might as well have cheese). If you’re still unsure about how academics and green beans go together, the point is that sometimes you don’t get what you want (yes, Mick Jagger strikes again). While you can sulk and lament disappointing meetings or missing recipe ingredients, you’ve also got to work with what you have; as a friend of mine suggested, “go on the offensive and hopefully come back swinging.” A lot of the time, by being proactive, what initially seems disappointing can turn into something wonderful; you just have to choose to be ok with the unexpected, to make it work for you. Trust me. 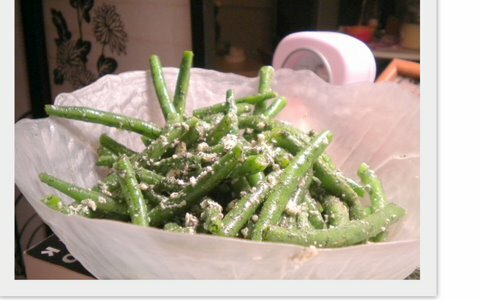 And if you don’t, make these green beans and you’ll instantly understand. -Fill a pot with water, season with salt and bring to a boil. 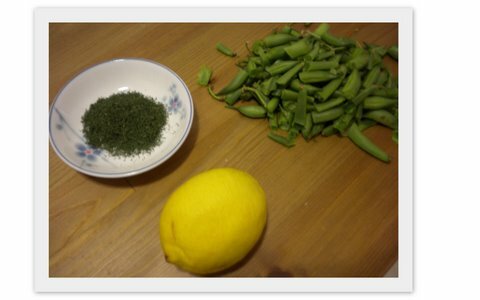 -Plunge the beans into the water and cook for 3-4 minutes, or until tender. You want the beans to be firm, not droopy. -Drain, then return the beans to the pot. -Add the butter, stir in the dill and then the feta, lemon juice and season with pepper. -Toss the beans over low heat until the butter is melted. -Taste and adjust the seasoning–it may take a little extra dill and salt to reach the perfect flavor combination.